The dynamic between the two was well thought out though, even if I did groan at a Romeo and Juliette reference. These characters in their own right were highly real and engaging and being together was destined to raise the tension (and it did) but it all seemed a little too obvious, too flowery and too loaded with romance metaphors at times. But as readers go I don’t have the most romantic of souls; I freely admit it. This might be sounding like a fun read to you already. And I do recommend it. Because G S Jennsen is a really good writer who truly knows good space opera. The descriptions of starship battles here are first class. When I asked the author a little about the book via twitter, I won my bet with myself that Peter F Hamilton would come into the mix. G S Jennsen is a little more economical and pacey than our mutual hero, but the techobabble I liked is still there, and even when I had to read twice to get my head around what was happening I thought ‘But I always did like doing this anyway.’ There was an early take on the FTL engine that I really liked, and a ‘neural network’ that’s a popular trope in sci fi done very well, and for effective story purposes. I did like the idea of Earth being used as a ‘bearing’ as well thanks to ‘the intrinsic human need’ for it. There’s a nice use of pulsar stars (which on a side note did make me reach for a couple of astronomy books to look into how the author might have thought of this setup), and I like the concept of ‘amodiamond’ so much I might just ask the author if I can steal it. It’s a challenge to create believable tech in a world with lots of planets, high military capability and double agents always looking for ways to outsmart the system. In this, the author wins full marks. If you like military sci-fi, or books heavy on espionage and double dealing characters, read this book. Ignore the title that I would have taken a pass on had I not read some shorter fiction by the author – this book really isn’t a sci-fi romance when it all comes down to it – it’s an interplanetary war story with plenty of behind the scenes deals and shady characters, some of whom it’s possible to have quite the measure of sympathy for. The conflict within the military ranks, including the high ones, is a lot of fun to read, and very well written with a great sense of timing and pace. 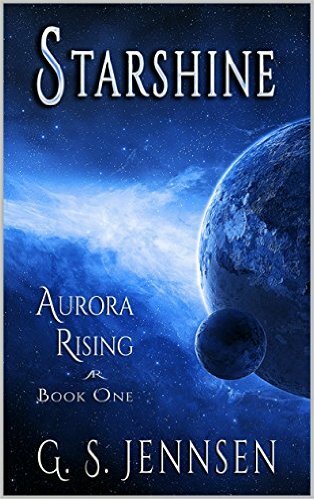 Starshine is a page turner, and one of the better ones I’ve read. I will definitely check out the rest of the series.